Famous soap opera scriptwriter, Clementine, is slowly losing her memory and decides to embark on a road trip down memory lane (in a golden convertible) in search of her greatest love and ex-husband, Nightingale, an artist whose uncompromising artistic integrity is opposed to Cementines’s fickle life in the world of TV drama. It is a series of letters by the street poet Nightingale, written over several weeks and hand-delivered to the inhabitants of the street where they lived, that cracks open the novel. The letters, triggered by a mysterious couple who make love loudly in the middle of the night, keeping the neighbourhood awake, touch upon the nature of love, war, lust, capitalism, and childhood, highlighting the paradox of the human condition through playful humour. 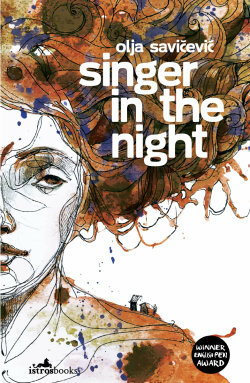 Singer in the Night is a rich, sensual novel which comments on perception, on how life is really lived – never objectively, never encompassing the whole truth, and yet no less real to us. In its final message, the novel gives a playful warning about the consequences of choosing banality – whether it be nationalism, vanity or fame – over true human connection.